Some bands are born to experiment, push the envelope and marry different metal genres. Others never change and their consistent albums slowly begin to embody the particular genre they represent. Isn’t it true that the name Bolt Thrower comes to mind when one thinks of uncompromisingly stubborn death metal? Formed with punk influences and briefly going through the grindcore period, these Brits have come to almost personify death metallers focused on the subject of war. Their albums, one after another, Realm of Chaos, IV Crusade, … For Victory, are all like loads of ammunition – stylistically similar, designated for the sole purpose of weighing down the man while steadily blowing him to pieces. Not that Bolt Thrower machine was ever sputtering, but the shot in the arm was definitely needed. The band has been so completely dedicated to the fans, it tends to do a lot of things surrounding the business of making and distributing their albums themselves. Such approach may keep the cost (and in turn the prices) down, but it has forced Bolt Thrower to go on one album per 4 years schedule. The situation is fraught with danger. One misfire and the Brits risk becoming irrelevant. Honour Valour Pride (2001), although a solid album, left something to be desired, and if Those Once Loyal did not deliver it would have been another 4 year wait for the answer. Those Once Loyal shows Bolt Thrower remaining Forever Loyal to what made them the band they are. The music on this album is not about who plays the fastest or with the most flair. 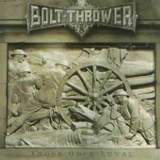 I am in no way accusing Bolt Thrower of plodding tempos or lack of technicality, but the songs on Those Once Loyal rely on the power of mid-tempo well written but simple, hard hitting and straightforward riffs. Without the trademark Scandinavian tremolo of Amon Amarth or downtuned melodies of God Dethroned, Bolt Thrower riffs are almost vibrato, bouncy in their steps (The Killchain) and allow the fans to headbang with pride. The instrumental part of Those Once Loyal songs are possessed with Granite Wall persistence and undeniable groove. Not of the kind In Flames is making popular by strumming the same note or a chord, but the one where you want those riffs repeated multiple times (title track). Bolt Thrower does sound epic, without a big orchestra or Egyptian choirs. At First Light is ominous, Anti-Tank soars with its layers and cymbal crushes and When Cannons Fade is an anthem with a classic song and album ending drum solo. And if you want variety solos are also provided (air raid siren in Granite Wall), while Last Stand of Humanity goes for the rare temp change and thrash attack. All musicians give their best, but two performances are of the special note. Karl Willets is back on vocals, and although Dave Ingram (Benediction) should be commanded for stepping right to the plate on Mercenary and Honour Valour Pride, Karl Willets’ voice is true Bolt Thrower, just one legible low guttural singing, not a trace of raspiness in his voice. The way Bolt Thrower lyrics go – it is about war, but more about heroes and pride than gore and death – Karl is a perfect compliment. Jo Bench, the female bass player, has been in the band from the inception. She is a metal warrior, and not because it is trendy to have a female member, but because her manly slapping bass lines are what makes Bolt Thrower rhythm section so special. Producer Andy Faulkner should be the sixth member of the team, as he has come up with the sound recognizable from the get-go. Honour Valour Pride had that sound as well, but Those Once Loyal has a lot less meandering and a lot more energy than its predecessor. The critics will say Bolt Thrower has been rewriting the same song over and over again for the last 17 years. Those peoples’ opinion will be hard to change. You have got to be a fan (me) of this band to actually recognize their lack of change as non-compromising attitude and dedication. I’ll say this, when I go to a steakhouse, I do not expect to eat there a vegetarian or tofu sandwich. I want my steak raw and dripping with blood. So when such dish is served you should not be surprised. However, if you are a vegetarian you should be avoiding that steakhouse in the first place.